The official 2016 Maine Lobster Boat Races Schedule has now been published and I am including the topline details below. Enjoy! June 18th – Boothbay Harbor Lobster Boat Races. These races are best viewed via boat. June 19th – Rockland Lobster Boat Races. These races are best viewed via Rockland Breakwater. The Rockland Lobster Boat Races have good prizes and draw a nice crowd of local boys and big boats from the surrounding islands. Expect lots of rafting up and partying. July 2nd – Jonesport Beals (Moosabec Reach) Lobster Boat Races. These races are best viewed from the Beals Island bridge. This is perhaps the most iconic race of the season as Maine lobster boat racing as we know it originated in these sheltered waters between Jonesport and Beals Island. The races are always highly competitive and the towns host 4th of July events alongside the racing. The iconic arching bridge which connects Jonesport to Beals Island is an excellent vantage point for watching the boat races. For a look at the Jonesport Beals / Moosabec Summerfest 4th of July schedule, click here. 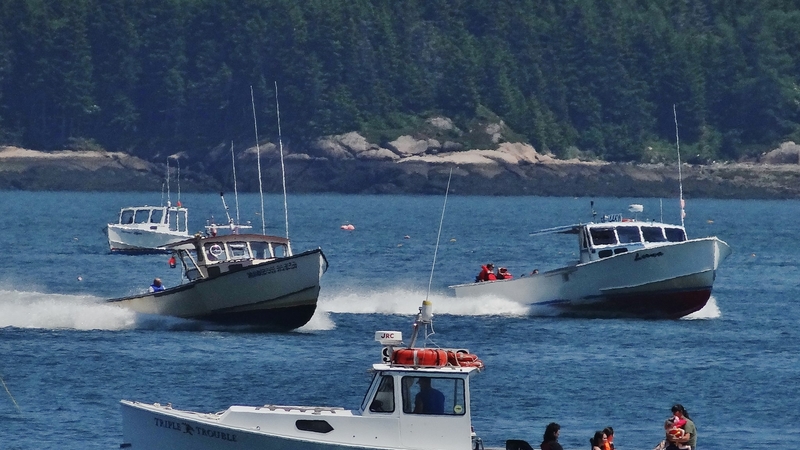 July 3rd – Bass Harbor Lobster Boat Races. These races are best viewed via boat. A blessing of the fleet takes place after the races. July 9th – Searsport Lobster Boat Races. These races are best viewed from Mosman Park or the town landing. July 10th – Stonington Lobster Boat Races. These races are best viewed via boat. A pancake breakfast is held before the races and crab meat rolls are served in the odd fellows hall after (you haven’t lived until you’ve had a Stonington crab meat roll)! Stonington is one of the most picturesque lobster fishing villages in Maine and well worth a visit even if you can’t make it to the races. Bagaduce Lunch, in Brooksville, is a great lobster shack to check out if you’re in the area. To read about Stonington’s Annual Fishermens Day, which takes place the week after the Stonington boat races, click here. July 24th – Friendship Lobster Boat Races. These races are best viewed via boat. August 13th – Winter Harbor Lobster Boat Races. These races are best viewed via boat. The races form part of a wider Downeast Maine Lobster Festival held in the town that day. The festival itself is well worth a visit and includes a pancake breakfast, parade and lobster dinner. For a look at the schedule for last year’s Downeast/Winter Harbor Lobster Festival, click here. August 14th – Pemaquid Lobster Boat Races. These races are best viewed from the top of the tower at Pemaquid Colonial Park. August 21st – Portland Lobster Boat Races (MS Harborfest). These races are best viewed from Fort Allen Park/the Eastern Promenade (including the walk-way below). I’m not 100% sure but the general rule is that they start at 10am unless otherwise stated. Any thoughts on if races will be cancelled due to the weather tomorrow?